Yesterday was a long day and a good one. Up at 5:30 am, out the door and in my car by 7, and arrived at my destination 90 minutes later. I spent the day doing working with 1000 High School students from around the state who were truly inspiring. Afterwards, I met up with a friend for dinner and didn't get back home until 7:30. 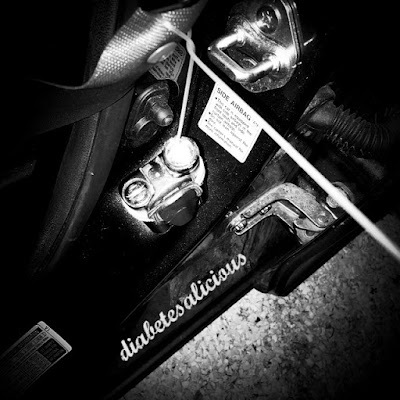 On the way home, I stopped for gas, and felt my insulin pump unclip from my waist as I turned to reach for my wallet. I was wearing my long winter wool coat - sometimes my pump dislodges when the trifecta of sitting, seat belts, and thick long layers are involved - add when you add the fact that my pump clip lock broke over the holidays and the Insulin Pump Winter Trifecta turns into a quadruple of interesting. After unclipping twice, I pulled over to the side of the road, grabbed my insulin pump, gathered my pump tubing, and carefully clipped the pump to my coat lapel, making sure the tubing wasn't tangled in the seat belt. Then I got back on the road and 25 minutes later I was home. I turned off my car; grabbed my keys and handbag, then carefully unclipped my seat-belt and gave a quick pat down to made sure that the pump tubing wasn't tangled, and got out of the car.... and was immediately yanked back into place when I went to shut the door. I laughed out loud, grabbed my phone out of my handbag and snapped this pic! And yep, that's a rubber-band MacGyvered around my pump for reinforcement - and YES, I'm ordering a new one!